Our CD «Geography of Sound» has just arrived! We are so happy to finally be able to hold the result in our hands and proudly present it to each and every one of you personally. Releasing our debut CD has been a long journey, but we so openly put a part of our souls in it and had such special people involved on the way, that it became a priceless milestone in our lives. We are starting the send out from the next week on. Each of you will be contacted personally on the next weeks and will be delivered your own copy of «Geography of Sound». A heartfelt, warm thank you to all of you for helping us make our dream come true! A big thank you to you all from our hearts, for your support and for letting us do such a good start on our campaign. We are looking forward to the following weeks to see how our campaign develops, and your contribution gave us a big inspiration and energy! We can’t wait for our dream to come true and make you proud! DOWNLOAD CODE	The Download code will be sent to you on the day of the release of the album! THE CD! The CD signed by all three of us with a greeting card, will be mailed to your home! THE PHOTO! We are inviting you to take a nice photo with us at an earliest possibility in Vienna, which we will frame and send to your address together with a signed CD. «AUTHENTIC SWEET TOOTH» Together with our signed CD we will send you a delightful selection of traditional fine sweets from two or three of the countries we come from of your choice: Slovenia, Azerbaijan, Russia, Mexico, Turkey or Austria. «AUTHENTIC DRINKING» For an utterly relaxing time to enjoy music, you receive our signed CD along with your preference of one fine bottle of a national drink of the countries we come from: Slovenian schnaps or wine, Russian vodka, Mexican tequila, Turkish raki or Austrian wine. TICKETS! Get 2 tickets to one of our concert of your preference to be looked up on our website (also for future concerts tba). 2 signed CD’s included! MY DEAR MELODY! If you have a song or a melody that is particularly dear to you, we will play a Trio KlaViS version of it, record and send it to you with a dedication or to a person you want to give a special present to! 2 signed CDs come with it. IT’S ALL ARRANGED! Any piece up to 10 min will be arranged by Miha for the instrumentation of your choice! Signed CD included. 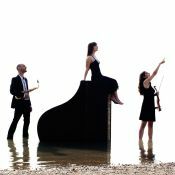 Trio KlaViS is a young ensemble of diverse origins based in Vienna. In the off-beat combination of piano, violin and saxophone performing creative programs, Sabina Hasanova, Jenny Lippl and Miha Ferk capture the young audience as well as classical music lovers, serving the well-known in a new apparel, forgotten jewels, very new pieces of art, as well as their own compositions.